by Mash, Eric J.; Barkley, Russell A. This highly respected reference and text on developmental psychopathology brings together leading authorities on the psychological, biological, and social-contextual determinants of child and adolescent problems. The comprehensive introductory chapter provides a state-of-the-art developmental--systems framework for understanding behavioral and emotional disturbances. Subsequent chapters synthesize the developmental bases of specific disorders. The characteristics, epidemiology, developmental course and outcomes, and etiological pathways of each disorder are described, as are risk and protective factors and issues in conceptualization and diagnosis. Important unanswered questions are identified and implications for treatment and prevention considered. *Includes DSM-5 criteria and discussion of changes. *Incorporates over a decade's worth of research advances in genetics, neurobiology, and other areas. *Chapters on bipolar disorder, suicide/self-injury, obsessive-compulsive spectrum disorders, and personality disorders. Eric J. Mash, PhD, is Professor Emeritus of Psychology at the University of Calgary and Affiliate Professor in the Department of Psychiatry at Oregon Health and Science University. He has served as an editor, editorial board member, and editorial consultant for numerous journals and has published widely on child and adolescent psychopathology, assessment, and treatment. 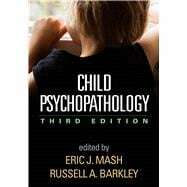 Dr. Mash is coeditor (with Russell A. Barkley) of Assessment of Childhood Disorders, Fourth Edition, and Treatment of Childhood Disorders, Third Edition. Russell A. Barkley, PhD, ABPP, ABCN, is Clinical Professor of Psychiatry and Pediatrics at the Medical University of South Carolina. Dr. Barkley has published widely on ADHD, executive functioning, and childhood defiance, and is editor of The ADHD Report. A frequent conference presenter and speaker who is widely cited in the national media, he is past president of the Section on Clinical Child Psychology (the former Division 12) of the American Psychological Association, and of the International Society for Research in Child and Adolescent Psychopathology. His website is www.russellbarkley.org.